Save KPFA is apparently claiming that United for Community Radio (UCR) wanted to eliminate the show — this is UNTRUE. 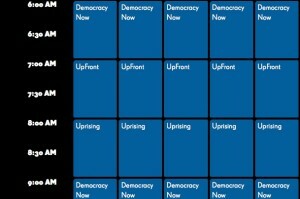 United for Community Radio has always wanted Democracy Now! to air at 7 a.m. on KPFA. 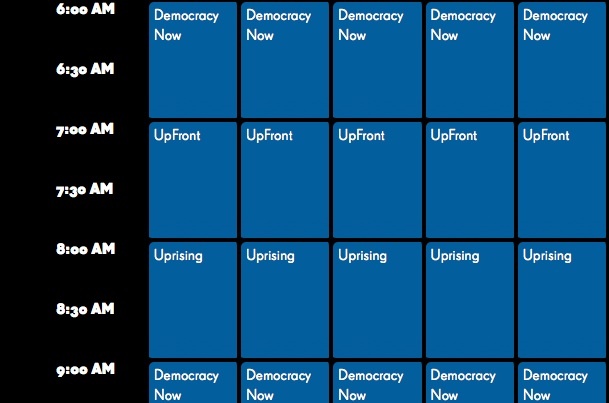 At the time in 2011 (and as it is now) KPFA airs Democracy Now two times each morning, at 6 a.m. and again at 9 a.m. UCR wanted Democracy Now to be on the airwaves one time in the morning, at 7 a.m. As Richard Phelps says, you put your most listened to program at the most listened to time. Therefore, UCR wanted Democracy Now to have one slot in the program line-up, at 7 a.m. This would open the 9 a.m. slot for additional local programming. The Save KPFA forces wanted to keep drive time for the paid staff, apparently so that paid staff can claim that their programs are the biggest fundraisers for the station. More information can be found here, in an article written at the time these events were happening. [T]he governments of Tunisia and Egypt have fallen and massive non-violent uprisings are occurring throughout North Africa and the Arabian peninsula, all this widely covered daily on KPFA which recently became the only national network carrying Al Jazeera-English. In addition, the staff of the program Voices of Middle East and North Africa put together extended shows that aired in prime time with fantastic commentary from experts and activists rarely heard anywhere in U.S. media. At the same time Amy Goodman’s Senior Producer, SA Kouddous, an Egyptian-American, traveled to Egypt where he was on the scene daily reporting from Tahrir square as well. Through the good sense of Pacifica ED, Arlene Engelhardt, Goodman’s show, Democracy Now (KPFA’s most listened to program) is now running in the 7 a.m. drive time slot, complemented by a diverse and local Morning Mix show at 8-9 a.m. which has also brought to KPFA airwaves many new voices and perspectives. This entry was posted in Analysis, Basic Information, Election Info and tagged 2015, Democracy Now!, election, kpfa, Mara Rivera, remove Democracy Now, Save KPFA, ucr, united for community radio by Webworker1. Bookmark the permalink.